Fang Lijun, ‘2016’, 2016. Woodblock print on silk, 244 x 366cm. Courtesy: the artist and Vermillion Art, Sydney. 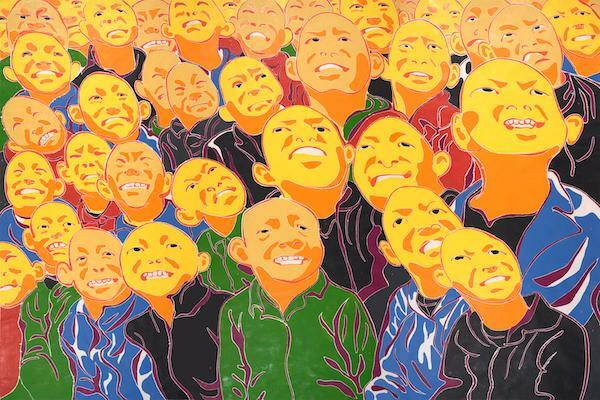 Vermilion Art presents ‘Fang Lijun: Facial recognition’, the first solo exhibition by Fang Lijun in Australia, a contemporary Chinese artist who enjoys an almost rock star status in China and internationally. The set of striking mostly large woodblock prints on show were made between 2013 and 2018. The grinning and grimacing bald heads, a recurring theme in his work, point to the artist’s concerns for ordinary people struggling to keep hold of an individual identity in contemporary societies, both East and West.